Helensburgh was first known as ‘Camp Creek’. It was mainly a tent town of railway workers who were constructing the Illawarra railway line. There are two different explanations for the choice of the name Helensburgh. The first is that the town was named after Helensburgh in Scotland, birthplace of the Cumberland Coal Mine’s manager, Charles Harper. The second explanation is that the town was named after Harper’s daughter, Helen. Today Helensburgh in Scotland and Helensburgh in NSW are sister cities. Until the early 1880’s there was very little settlement between Sutherland and Little Bulli (Stanwell Park) as the land was considered desolate, rugged and wild. There were some small holdings but because of the difficulty in travelling through the area it remained largely undeveloped. In 1883 the Cumberland Coal and Iron Mining Company took a 99 year lease on 18,000 acres of Crown land and in 1884 were successful in finding coal in the area. The Metropolitan Coal Company of Sydney took over the lease in 1887 and a mine opened in 1888. A miner’s camp was established and the area became known as Camp Creek. The first residents of Helensburgh were railway workers, miners and their families. Early dwellings were tents and rough shanties built from turpentine and iron bark from Otford sawmills. In the 1890’s fifty, four room cottages were built for mine employees by the Metropolitan Coal Company. In 1884 there was a great demand for a rail service from Sydney to Wollongong and the construction of the Illawarra line was commenced. 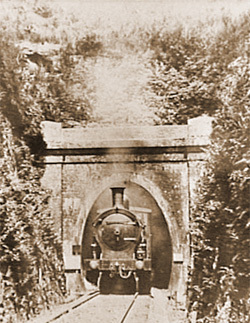 Settlements for railway construction workers were established at Otford and Cawley in 1884 and the coming of the railway in 1888 provided improved communications for the isolated Helensburgh. Helensburgh growth depended on the operation of the Metropolitan Colliery and its establishment was due to the opening of the railway line. In October 1888 a continuous service from Wollongong to Sydney was opened. 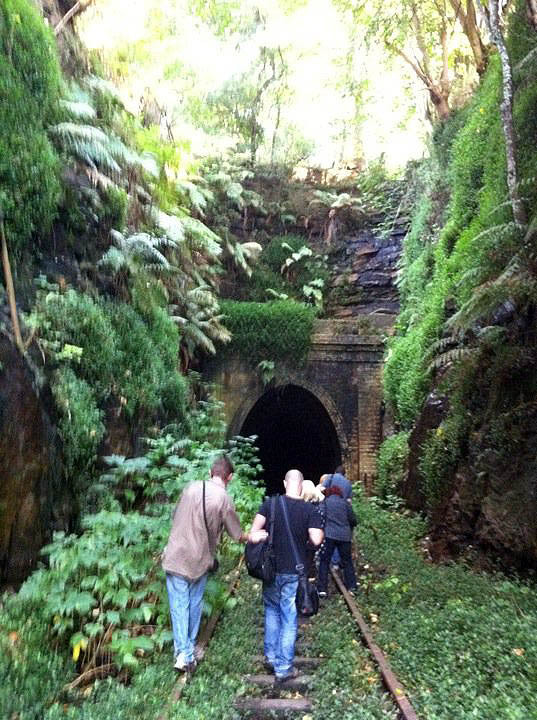 The Metropolitan Tunnel is the 4th tunnel on the original Illawarra Line, and is an elliptical-shaped 624m single track tunnel nestled between the Helensburgh Tunnel 1st (Tunnel No. 3), and the Metropolitan Colliery, where it exits. It opened on the 3rd October 1888 and closed permanently on the 30th May 1915. Helensburgh’s original railway station operated from January 1889 until the tunnels were closed on 30th May 1915. Like all six disused tunnels in the area, this tunnel had a very short life of 27 years of allowing trains to pass through her. After the deviation went through to alleviate track congestion, (from the trains) and lung congestion of the passengers*, the old single alignment slowly faded away as a train line. *(Asphyxiation of the passengers while trains either stalled or hauled slowly through the dark tunnels was a big problem on the 1 in 40 grade). Some of the closed rail tunnels in the area, including the Metropolitan tunnel, were used for mushroom farming. Lilyvale Mushrooms Pty Ltd began in 1952 in a very small single tunnel at Lilyvale and in 1959 two tunnels were in operation. Mushroom farming in the Metropolitan tunnel ceased and by 2010 the Department of Lands proclaimed the Helensburgh Station Reserve for environmental and heritage protection. Until recent years the old Helensburgh railway station had been covered in earth but has now been restored for historical purposes. The curved platform is a rare remainder of early railways and connected to a branch line. Original track has been reinstalled and the site cleared by the Helensburgh Landcare Group. The tunnel is now home to a large population of glow worms which provide a spectacular display. On the 13th June 1895, a coal miner from Clifton, working at Helensburgh’s Metropolitan Colliery took a fatal walk through one of these tunnels. A man named Robert Hales, a native of England, and recently employed at the Metropolitan mine, met his death in a frightful manner early yesterday morning. It appears that he was in town at one of the hotels late on Thursday night, and on his way home was run over by a train in a tunnel close to the Helensburgh station. His body was frightfully mangled, portions being found a considerable distance apart. A miner named Robert Hails was run over by a train and killed early on Thursday morning in one of the tunnels near Helensburgh railway station. He had stayed rather late in the township and on going home had to pass though the tunnel where the accident occurred. The driver of the train, feeling that something had been run over, stopped the train and went back, and found the deceased lying dead and terribly bruised. One leg was cut off and carried about two chains from the body. The stationmaster was roused, and the Helensburgh police communicated with, and the body was conveyed to a hotel for the inquest. The deceased, who was 39 years of age, leaves a widow and six children unprovided for. Evidence was given by Isabella Hails (wife of the deceased), William Hanley, James Gordall, Henry Jeffreys (driver of the engine) Thomas Smith (guard), and the local constable (J.H. Wilkinson). The jury returned the following verdict – ‘That deceased came to his death by injuries accidentally received on the 13th of May through being run over by a passing train – No.67 – in No. 2 tunnel on the Illawarra line. We desire to add the deceased was trespassing on the line, and great credit is due to the driver and guard in calling instant attention to the accident and stopping the train’. It is uncertain whether the accident happened in the Cawley (No.2) tunnel, as reported by the “Illawarra Mercury” or possibly in the Metropolitan tunnel which is closer to the old Helensburgh station. The date of the accident reported by the Mercury is incorrect and his surname is spelled differently in the two reports. Click here for more information. 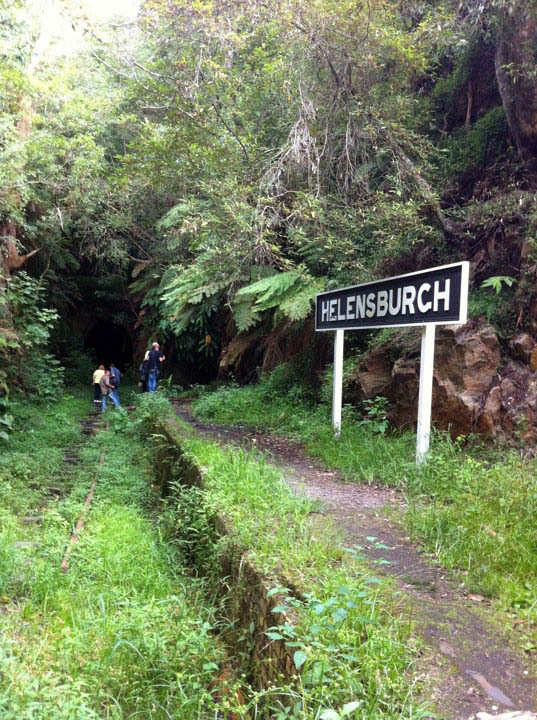 1st Helensburgh Railway Station Site to be Protected. The team investigated the No.4 tunnel (Metropolitan 1st – close to the southern end of the old railway station) where there might have been a death in 1895, as well as another tunnel nearby, No.3 (Helensburgh 1st tunnel) where supposedly a young man committed suicide by hanging. The 2nd tunnel was easily accessible from the roadside but had steel gates blocking access inside. 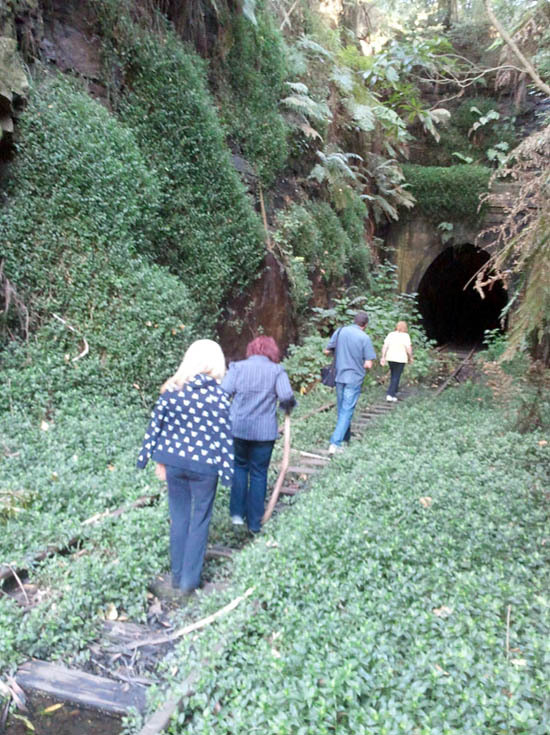 It had been raining the week prior to our Helensburgh Railway Tunnel investigation so consequently the ground around and in the tunnel was quite waterlogged. Once you moved past the actual station you had to manoeuvre yourself with gear in hand along the tracks without stepping on the muddy ground. My balancing act wasn’t quite perfected unfortunately and I landed ankle deep in boggy water on a couple of occasions. I was certainly glad that we had undertaken this investigation in the daylight hours as the process of getting in and out of the tunnel at night could have been an OH&S hazard. Once inside the tunnel it took several minutes for your eyes to adjust to the darkness. The tunnel is quite long and parts of it were impenetrable due to the amount of water. What was outstanding about the tunnel was the glow worms which gave the effect of stars glistening in a darkened sky. It had been rumoured that people had reportedly seen shadow people in the tunnel and we know of one confirmed death of a miner who was run over by a train in 1895. Several of our team commented that they had a sense of being watched but unfortunately no evidence of anything paranormal was captured on our equipment. 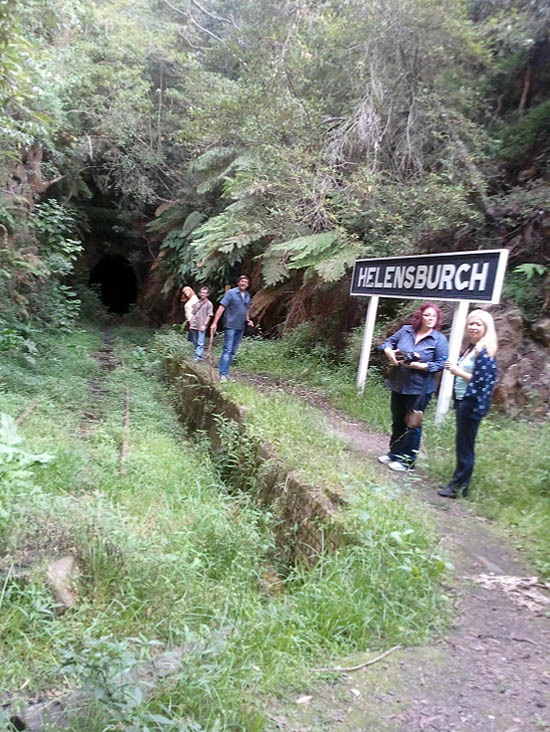 The team then proceeded to the No.3 tunnel (Helensburgh 1st tunnel) which is located across the road from the old station. This is the tunnel where supposedly a young man committed suicide by hanging, although we have not been able to get any confirmation that the suicide actually happened. This tunnel was easily accessible from the roadside but we were unable to access it due to steel gates on both sides of the tunnel blocking our access. What is interesting about this tunnel is that I actually perceived a very strong energy of a grounded spirit there. 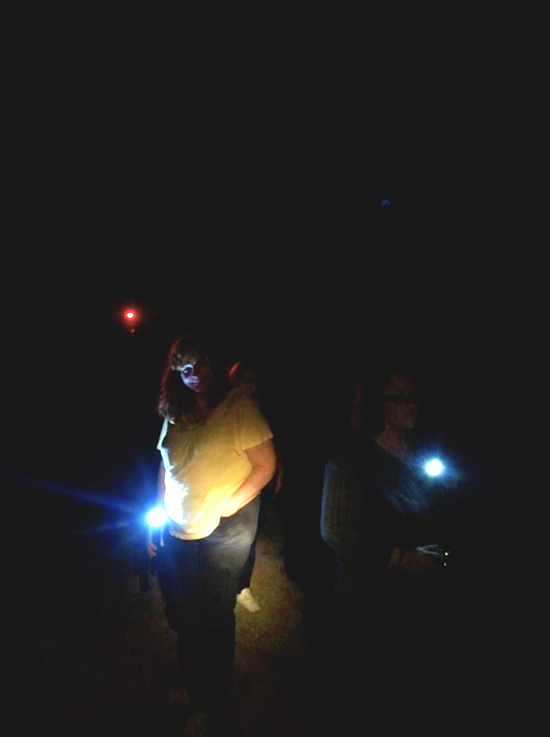 The SOuL Searchers team will definitely return to this tunnel at some stage to do another investigation.